Our site was decent. Large enough for our two vehicles and our forty-three foot rolling house. Unlike Malibu, we could enjoy campfires, but only if we were willing to share space with stray cats, less than desirable neighbors, and views of metal carports and storage buildings. Fortunately, our plans include driving into Yosemite National Park most days, which means I won’t spend many daylight hours in the landfill RV Park. 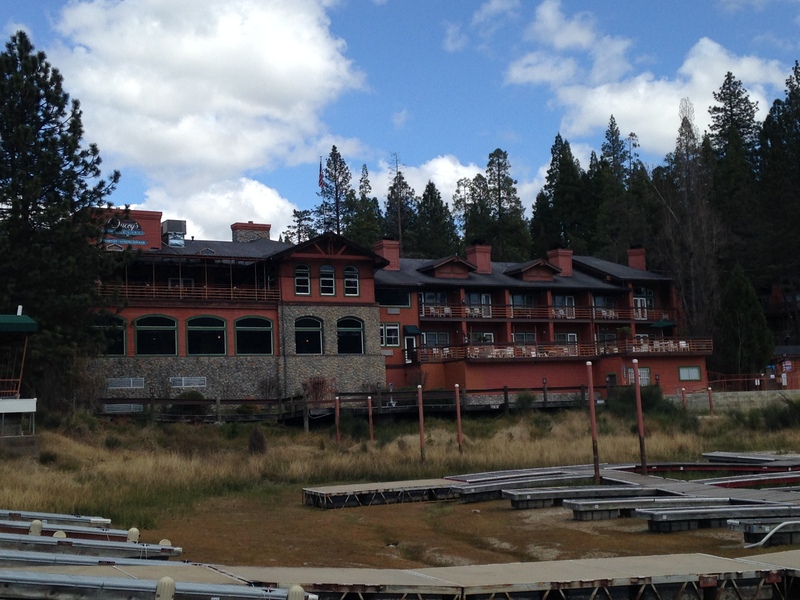 We couldn’t wait to explore all that Yosemite had to offer. 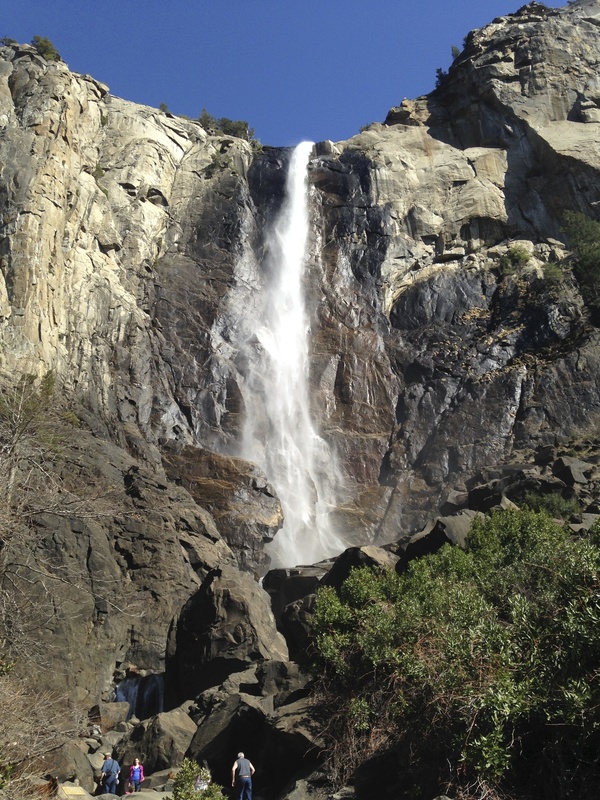 Mile high elevation, pine trees, waterfalls, and cool temperatures. Wait? Sounds a lot like Colorado… because it is a lot like Colorado. 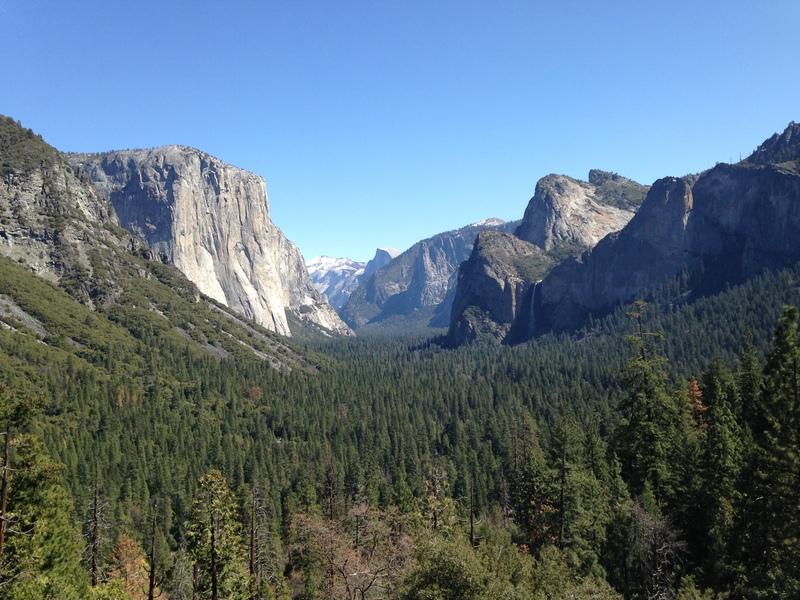 Except for the massive granite rock jetting up out of the same soil that coddles Sequoia trees for hundreds of years. Yeah, except for that. 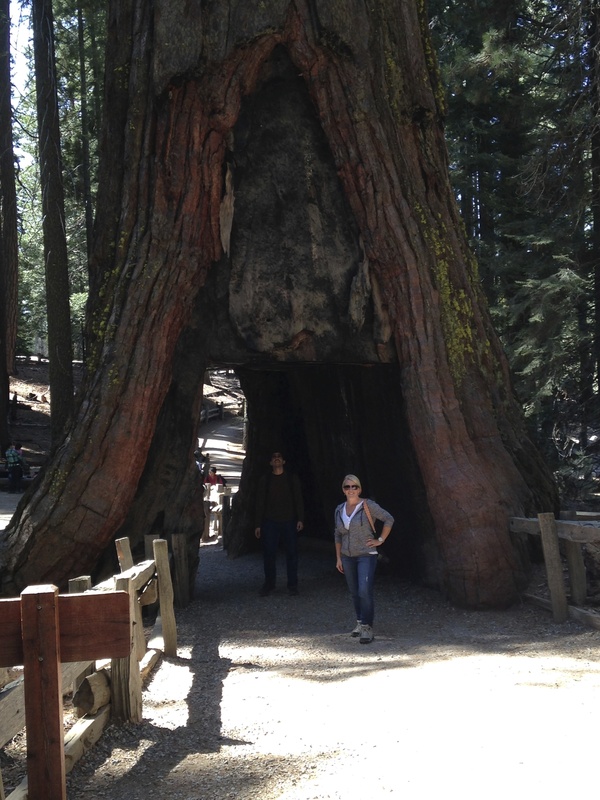 My husband, John, became obsessed with the Sequoia trees. The trees that are taller than most skyscrapers, thrive in high elevation climates, and resist fires allowing them to stand erect long past their Lodge Pole Pine sisters. 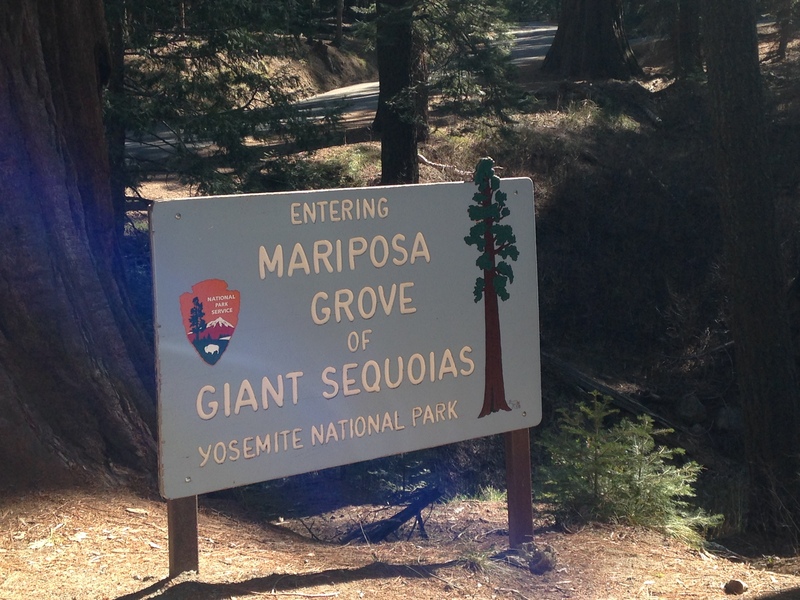 After day one in the Mariposa Grove of the National Park, he lay in bed with his iPad searching how he can farm his own Sequoia grove. 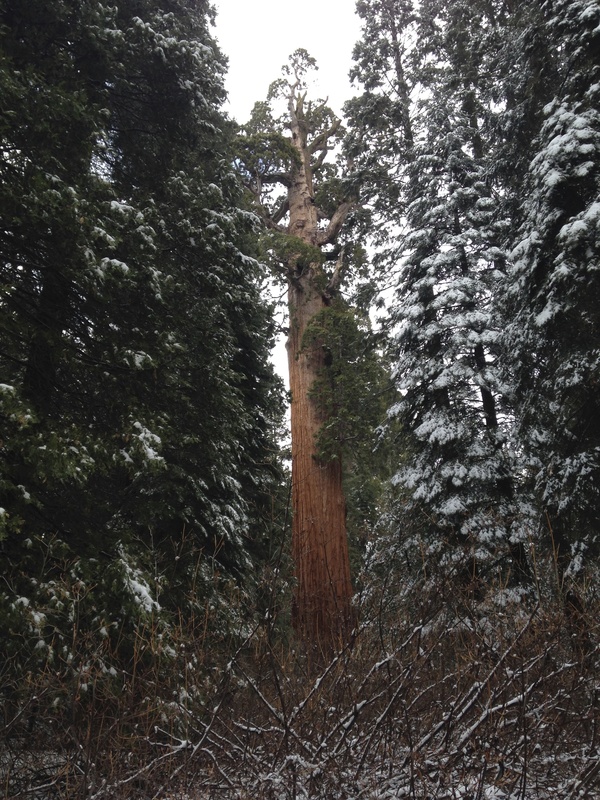 He discovered a Colorado man that blogged his own Sequoia trees’ journey from seed to sapling to puberty. John chewed on every word like a pregnant woman reading What to Expect When You’re Expecting. 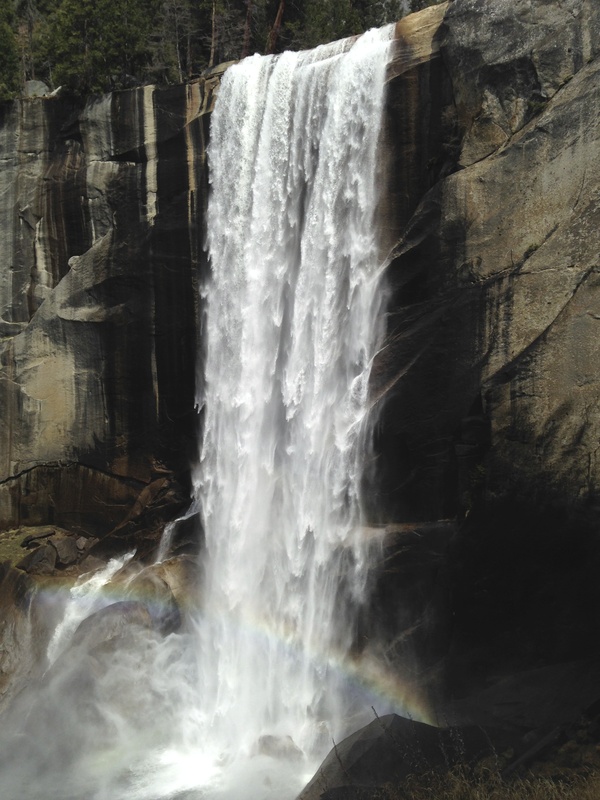 Day two of our Yosemite visit, I suggested a strenuous hike to the top of a waterfall to distract him. I simply couldn’t take any more tree talk. Even a non-hiking woman knows that desperate times call for desperate measures. I practically crawled up the final steep steps to the waterfall summit but the view and the accomplishment were worth John’s breathless inability to utter the word Sequoia. Unfortunately, the distraction wore off quickly and, a couple of days later, we ventured south from Yosemite to King’s Canyon, home of the second largest Sequoia tree in the world. 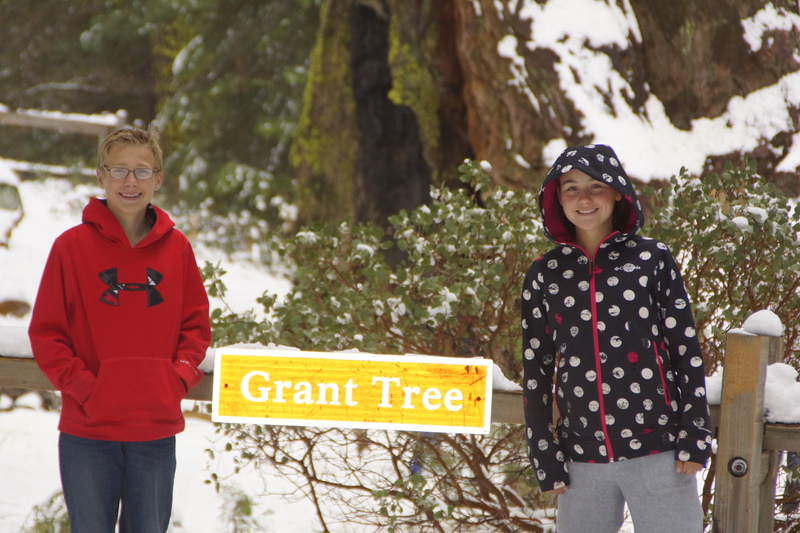 If you’re able to measure Grant’s overall wood volume, you’d quickly recognize this tree as the largest in the woods among its counterfeit neighbors. You just grab your extendable pole from your car trunk to determine vertical height. Then take several girth measurements as you rappel down the trunk of the tree from its highest point. Add these numbers together and, just like that, you have the tree’s overall wood volume. Students passing this homeschool course often go on to do these measurements for a living. Thankfully, there was a sign in place for the novice sequoia gazer as the previous night’s snowfall would’ve made rappeling unsafe. I made a deal with the kids: ooh and aah over this tree and I’d convince John not to drive another two hours to see Sherman, THE largest Sequoia tree in the world. With frozen hands and soaked tennis shoes, they joyfully agreed. Honestly, were it not for the darn trees, we would have been bored out of our minds. 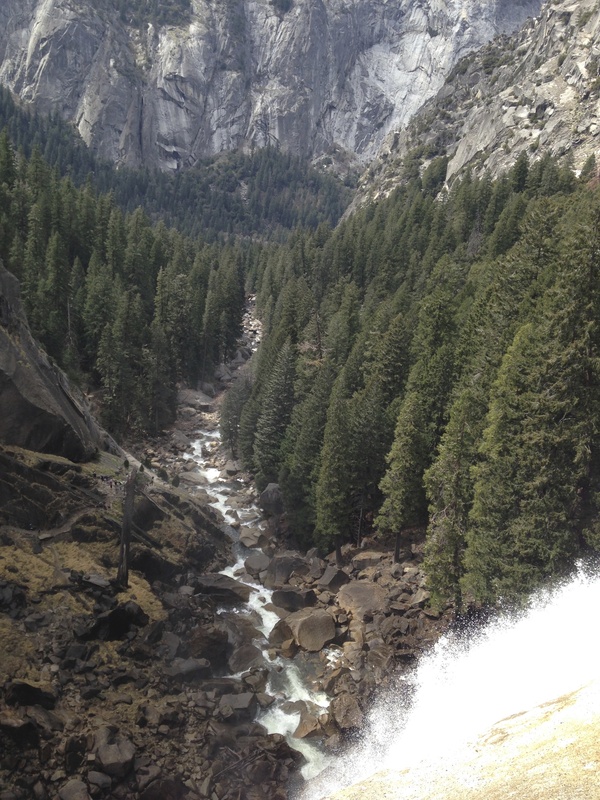 For the most part, the Yosemite landscape was just like being back in Colorado. It was sort of lost on us and we scheduled too much time in the area. 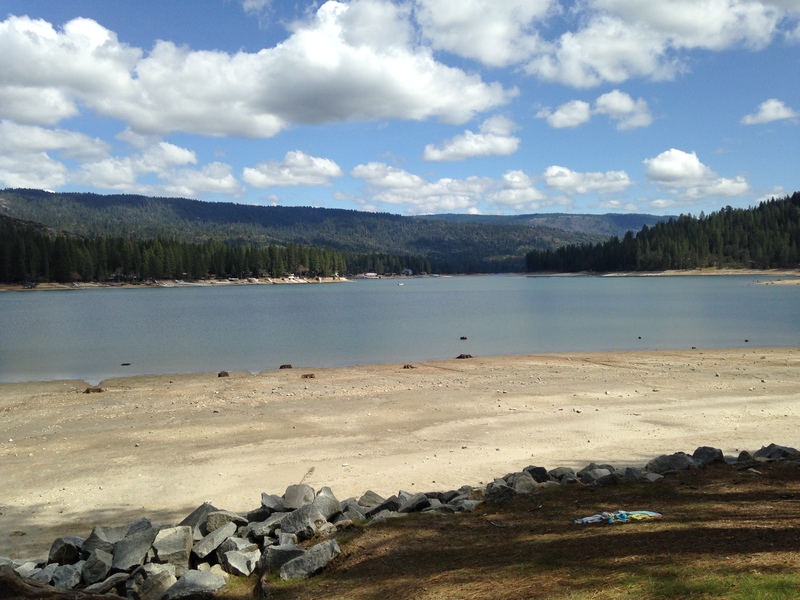 We drove over to Bass Lake one day. I got the oil changed in my car. We spent lots of time at the library. I got a mani/pedi. You know, all the touristy things in the area. We did feel the earth shake beneath us one evening around the campfire but even that didn’t warrant much excitement. Part of it was the RV trip blues. The newness had worn off. Maybe the pine trees and mountains reminded us of our friends we were missing. Just shy of the five-month halfway point, we started to question if we were on the right track. Family bonds seemed to be breaking more than building. My nagging was at an all-time high. I was tossing any fruit that God was producing in our lives into the Vitamix and pureeing it beyond recognition each morning. Unlike General Grant and the giant tree named in his honor, I was ready to wave the white flag. Surrender? Retreat? Nope, none of that. God was working within us; the unseen. We needed to shed light on the darkened path before us. Allow God to keep right on helping us grow in his grace. Finish the task God started within us. We’d gotten lax with our nightly devotions. I’d shoved my Bible to the back of my bedside cabinet. We’d let down our guard against the enemy’s strikes. We strategized, pulled the family back together, prayed, and entered our next address into the RV navigation system. In four hours, we’d be in San Francisco. No surrender. No retreat. No Sequoia talk. Nope, none of that. 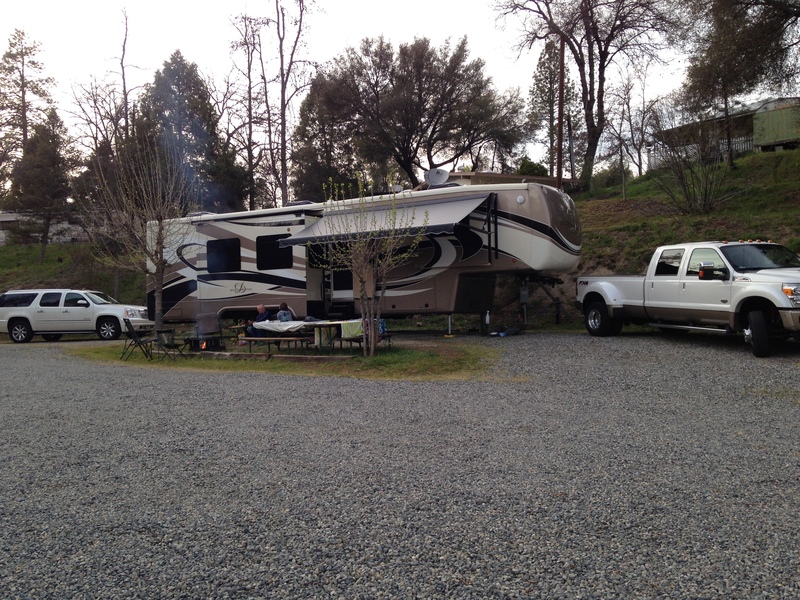 This entry was posted in Fifth-Wheel, God's perfect timing, Obedience, Parenting, Purpose, RV, RVing, Travel and tagged California, family, God, purpose, RV by Natalie Lewis. Bookmark the permalink. Its easy to lose our focus on the important things. Good times and bad, keeping a close hold on our Savior is the best way to weather any storm. Lord. Can’t wait to see what’s around the bend. Love u guys,we’re all still here. oh & u were quite funny.